“We’ve seen AWS cloud adoption accelerate during the past 12 months in New Zealand." AWS has expanded its channel base to over 1,000 partners in New Zealand and Australia, with the tech giant bringing on board “tens of thousands” of new customers on both sides of the Tasman. Revealed during a jam-packed AWS Summit in Auckland, in front of partners and customers, the world’s largest cloud provider has doubled its Kiwi team to cope with accelerated demand, as organisations across the country take to the skies. 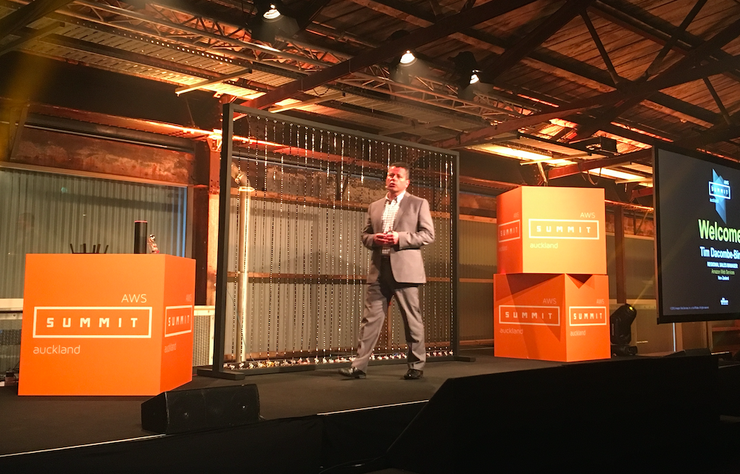 “We’ve seen AWS cloud adoption accelerate during the past 12 months in New Zealand,” says Tim Dacombe-Bird, Regional Sales Director, AWS. “And that covers every market segment, every size and every conceivable workload migrating onto the AWS platform. Fitting that the Cloud and Shed 10, two of the country’s most iconic buildings, should play host to the largest cloud gathering in New Zealand, with Xero, Fairfax Media and the New Zealand Defence Force among the many customer testimonials on show. In the heart of Auckland, at the AWS Summit, Dacombe-Bird says the vendor’s expanding channel remains core to such growth, with increased certification now required to achieve advanced tier status. “Our advanced tier partners now require a broader depth of experience, which providers greater value for AWS customers in New Zealand,” he adds. With leading AWS partners such as API Talent, Enterprise IT and Eagle Technology in New Zealand - represented by distributor Westcon-Comstor - Dacombe-bird says the vendor is widening its reach across the country, as outlined during registration numbers for the Auckland event. For the fourth year running, registrations closed early due to high demand, with over 2,000 customers and partners in attendance. According to Dacombe-Bird, 35 percent of attendees remain in the “investigate stage” of cloud adoption, outlining the potential growth for AWS technology across New Zealand. Breaking down the AWS usage, 40 percent of attendees represent the enterprise, 23 percent mid-market and 15 percent the public sector, with startups and SMBs representing 12 percent and 10 percent respectively. Globally speaking, AWS is present in over 190 countries worldwide, spanning 12 regions and 33 availability zones, with the Sydney region launched in 2012.